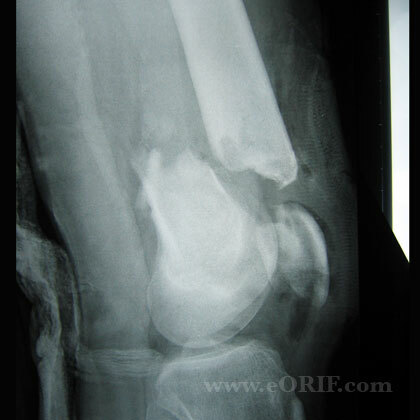 High-energy (MVA, Falls from height) in young patients, fragility fracture in elderly patients, periprosthetic fracture. Hoffa Fragment = coronal (frontal) plane fragment associated with comminution in the intercondylar notch. Present in @1/3 of Type C fractures. A/P and lateral views of the knee. -Treatment = ORIF via modifed lateral parapatellar arthrotomy (Starr AJ, JOT 1999;13:138). Generally articular reduction and submuscular locked plate positioning via a small incision with spanning of metaphyseal comminution. -Treatment = Lateral locked plating with indirect reduction (Ricci WM, JOT 2006;20:190). Consider primary TKA with tumor prosthesis for elderly osteoporotic patients with severe comminution. The linea aspera is the key to rotational alignment during surgery. 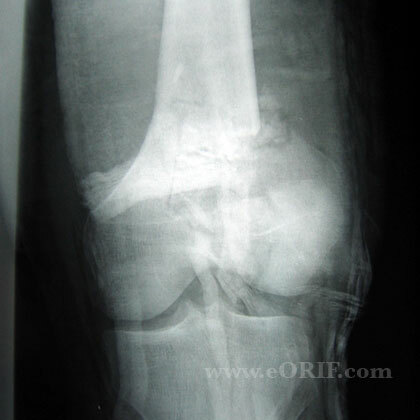 Drape out normal leg and ensure femoral head can be visualized with c-ram. Knee ligmanetous injury: ACL / MCL / LCL / PCL / PLC. Extension contracture: uncommon, usually caused by periarticular fibrosis and shortening of the rectus femorus. The Judet quadricepsplasty, based on muscle disinsertion and sliding, is the treatment of choice (Ebraheim NA, J Orthop Trauma 1993;7:327-330). 100% union, 5% valgus malunion, 9% external rotation of 10°-15°. 14% required implant removal. Average knee ROM = 5°-114° for locked plating. (Weight M, JOT 2004;18:503).